So, when someone on a TV show or anywhere else in the American media attempts to make a souffle, it always comes out burnt. So as you can imagine I was eager to show them wrong. Ha! Like that worked out well. The souffle tasted great actually, the flavors of the orange and chocolate combined was amazing. It just, was a bit soupier than one might want. But on the bright side, you can learn from my mistakes and hopefully if you attempt this you wont have the same soupy fate as I did. 1. Adjust oven rack to upper-middle position and preheat oven 400 degrees. 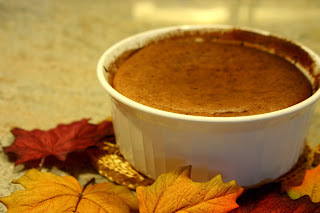 Grease 1 1/2 quart souffle dish with 1 tablespoon of butter. 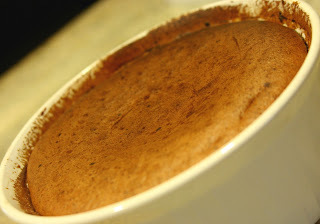 Combine 1/4 cup sugar and cocoa on a small bowl and pour into prepared dish. Gently shake the mixture around to coat the sides and bottom of the dish evenly. Tap out excess mixture and set aside. 2. Whisk flour, 1/4 cup sugar, and slat together in a small saucepan. Gradually whisk in milk, whisking until milk is fully incorporated and there are no lumps. Bring mixture to a boil over high heat, whisking constantly, until the thickened mixture pulls away from the sides of the pan. 3. Using a stand mixer with whisk attachment, whip egg whites, cream of tartar, and 1 teaspoon sugar on medium low speed until foamy approx. 1 min. Increase to medium high speed and whip until whites are soft billowy mounds, approx. 1 min. Gradually add half of the remaining sugar whip until glossy, oft peaks form, about 30 sec. Add remaining sugar and whip until just combined approx. 10 seconds. 4. Using rubber spatula, immediately stir one quarter of the whipped whites into the souffle base to lighten until almost no white streaks remain. Scrape remaining whites into base and fold in whites, along with the grated chocolate., with whisk until mixture is just combined. Gently pour mixture into prepared pan and run your index finger about 12from side of dish, through mixture, tracing the circumference to help souffle rise properly. Bake until surface of souffle is deep brown, center jiggles slightly when shaken, and souffle has risen 2 to 2 1/2 inches above rim, 20 to 25 min. Serve immediately. So as you can see, the souffle has not risen 2 1/2 inches over the souffle dish, but smelled the top burning, so we took it out fast. I believe that how much it has risen should be a first factor to see if you should take your souffle out. Also, notice that it says that the center should only jiggle slightly.